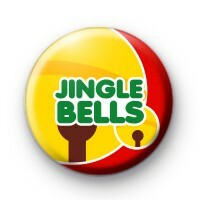 Red white and gold Jingle Bells badge. This classic festive badge is a nod to everyone's favourite Christmas Carol. So why not use this bold, bright Jingle Bells themed badge in your Christmas crafts. It would be a fun badge to pin to Xmas Stocking and Christmas jumpers during the festive season. Everyone needs to feel the Christmas Joy and I think with this badge pinned to your coat, bag or work uniform it will help you inject some holiday spirit into everyone. We have a huge range of Xmas badges available on the website, so many traditional Christmas designs and more fun Anti Christmas slogans, so make sure to have a browse through all of them before checking out.